The Meadowlands Commission's next free nature walk with Bergen County Audubon is Tuesday, Oct. 19, at 10 a.m. at DeKorte Park. 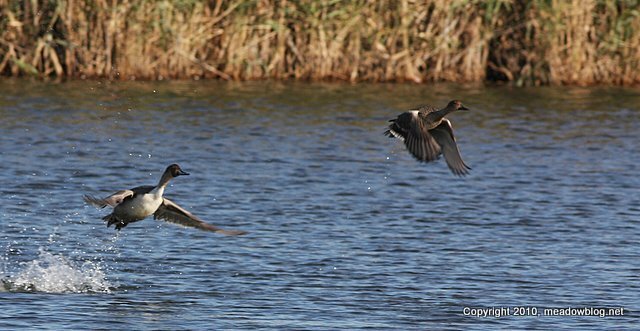 We'll look for newly arrived White-crowned Sparrows and new waterfowl (like these two Pintails above, photographed on Oct. 21, 2008, at DeKorte), plus any lingering shorebirds and a raptor or two. We also have a free bonus walk on Sunday, Oct. 24, at 10 a.m. at Mill Creek Marsh in Secaucus. The marsh is especially beautiful this time of year. Details on both walks follow.